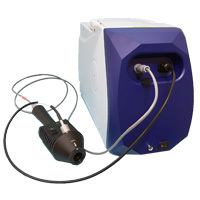 The i-Spec® 25 is a bbroadband portable spectrometer with a handheld reflectance probe for measurements across the Vis/NIR range from 400-2500 nm. The air-cooled system includes Si, InGaAs and extended InGaAs array spectrometers for optimal sensitivity and dynamic range for applications in fields such as mineralogy, materials science, plastics, agriculture, food, and optics measurements. The system comes with the iSpec® 4 software, which provides system control and data collection capabilities through a simple interface that optimally combines spectral data across the different ranges measured with the multiple spectrometers. For analysis flexibility, data can be saved in various data formats. The instrument is lightweight and has a carrying handle so that it can be transported to wherever measurements need to be made, giving users lab performance in the field.